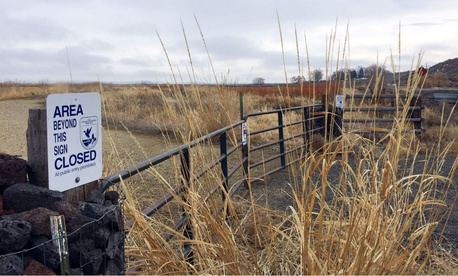 While the occupation of the Malheur National Wildlife Refuge has ended, federal employees reporting to the Fish and Wildlife Service facility will still wait several weeks before returning to work, federal officials have said. The FBI and local law enforcement on Thursday arrested the remaining militia members who had occupied the refuge building since Jan. 2. Still, law enforcement officials are treating the refuge as an active crime scene and will not reopen it for business in the immediate future. The FBI will deploy bomb technicians to “locate and mitigate” any potential explosives, Bretzing said. Law enforcement and tribal officials will then spend weeks identifying evidence of crimes and assessing damage to documents, artifacts and sacred burial grounds. Bretzing indicated that damage was significant and the cleanup effort would be intensive. He also warned any would-be occupier should think twice before following in the footsteps of those recently arrested. In a blog post, FWS Director Dan Ashe said any threats against federal workers would not be tolerated. The local sheriff in Harney County, Ore., gave an emotional plea for those who oppose federal land control to voice their opinions civilly. He urged anyone who has a “problem with a civil servant” to write a letter and to leave out any profanity. While the Malheur facility will remain closed for the foreseeable future, at least one federal office that closed out of safety concerns during the occupation has reopened. The Bureau of Land Management shuttered its facility in Burns, Ore., though no occupiers approached it. The office reopened on Feb. 9, a spokesman confirmed. The BLM Burns district office employs 97 permanent and 21 seasonal or temporary workers, all of whom were told to stay home while the facility was closed. About 10 of those workers teleworked, while the rest were on paid administrative leave. The salaries of those employees totaled $117,000 each week; the office remained closed for five weeks, meaning BLM spent about $585,000 paying employees to not work due to threats from occupiers. An additional 35 Forest Service employees reporting to the Emigrant Creek Ranger District office in Burns were also forced to stay away from their home base due to security risks. Some of those workers, as well as the 17 reporting to the Malheur site, have teleworked since the beginning of January, though many were on administrative leave. Those agencies were not able to provide cost estimates of their closures or cleanup costs. Ashe expressed optimism that the refuge’s work would, eventually, carry on. Ashe thanked FWS employees for their courage throughout the last several weeks, calling them a credit to public servants everywhere.